Sorry, I feel the need to rant a bit today. 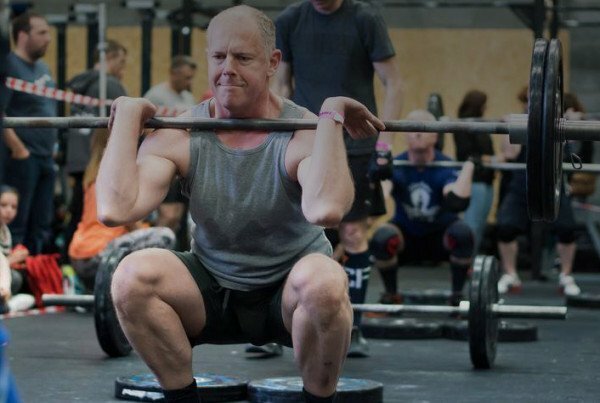 I just keep seeing too many tweets on Twitter about how proud someCrossFit folks are of their blistered and bleeding handsfrom doing pull-ups. 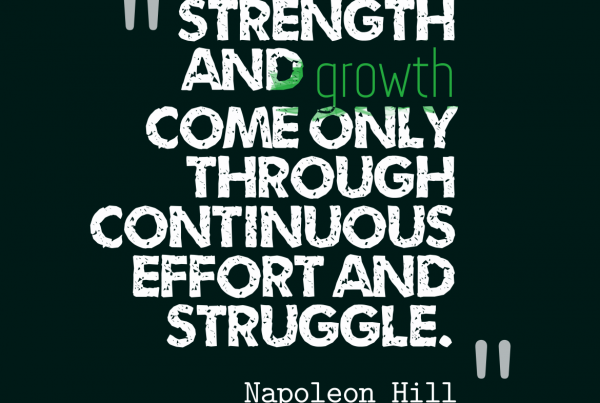 They are usually referring to high reps of kipping pull-ups. 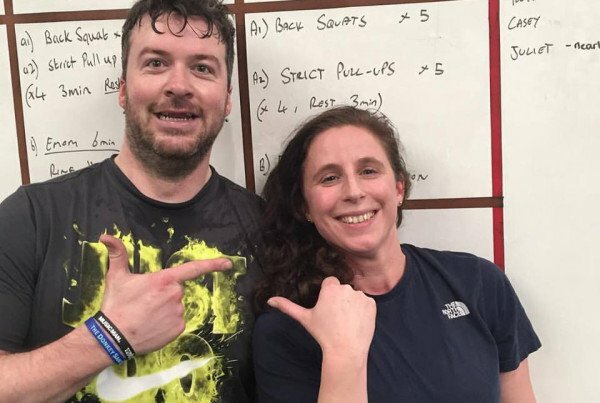 Bleeding hands from pull-ups aren’t some CrossFit “badge of honor”. 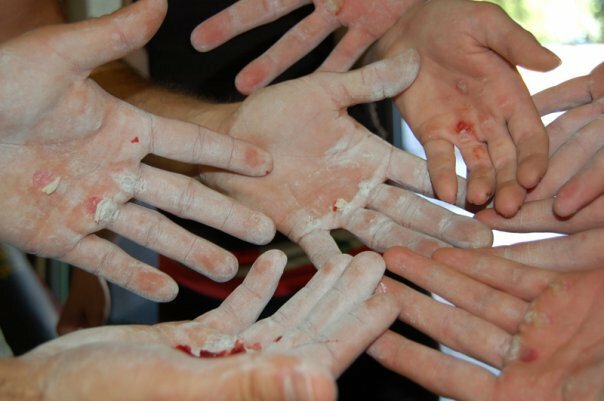 It’s actually an indicator that you aren’t gripping the pull-up bar correctly and you probably use way too much chalk. Now, before you get your hackles up and puff out your chest, I had the same problem. When I started CrossFit last year and began doing a high volume of pull-ups, I built up calluses and blisters. I noticed that it kept hurting more and more as that new callused area was getting pinched between the top of my palm and the bar. So, I did some research before it became a bleeding issue and I’ll share what I found below in some photos and a video. You really can avoid it! It’s all about your grip style and it builds up your grip strength and toughens up your hands more evenly. Stop using so much chalk! It makes your hands stick and creates too much friction (hence the blisters). 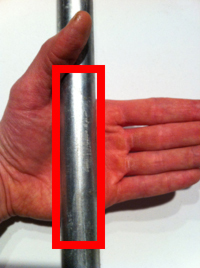 Change the way you grip the bar (see photos and video below). 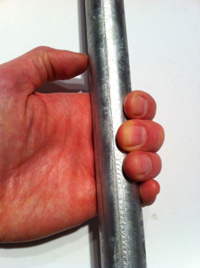 Most people naturally grip the bar in their palm. Not good. 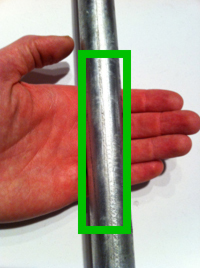 Notice how the skin is compressed between the bar and base of fingers. The pressure and friction from pull-ups then creates painful blisters. 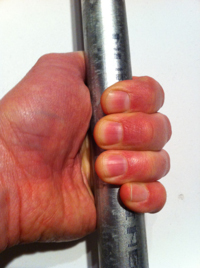 Instead, grip the bar so it centers across base of fingers, not the palm. 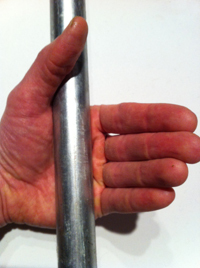 Wrap fingers around the bar tightly and “roll” it into your hand. I like the “gorilla grip” with my thumb on top of the bar. It takes some getting used to, but my hands seem to flex better when kipping. 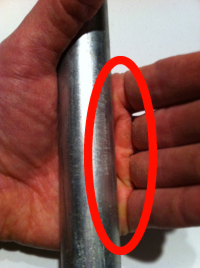 So, give this new grip a try the next time you do some pull-ups. Practice it and get comfortable with the grip before you go crazy with high-intensity kipping pull-ups. You don’t want to fall off the bar! Good luck!